The Gables at Manokin offers premier living without the premier price. We provide the retirement living you have been looking for. 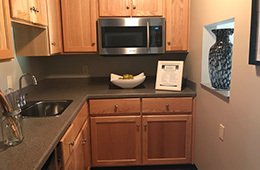 Our apartments offer residents a private kitchenette area, equipped with microwave oven, refrigerator, cabinets and counter space. Residents will enjoy their large private bath with a walk-in shower and a stationary seat. After your time of leisure is complete, come over to the activities area for an afternoon of featured entertainment or a group activity. Our community is filled with daily activities to keep each resident entertained. We know how important the dining experience can be for each resident here at The Gables at Manokin. All meal planning and preparation is managed by our registered dietitian and dietary staff. We take your personal safety and security seriously. The Gables Lifestyle includes an emergency call response system.